I have some bad news to report. Three of the tomato plants, all of the basil and all of the bean plants in the Ginsberg Garden died. We have many more replacements in the greenhouses at the gardens and plan on replacing the lost plants. We investigated the dead plants and the garden at large to try and determine the cause of their untimely end. From inspecting the dead plants, it appears frost killed them. Frost burn is a condition that plants exhibit when damaged by frost with the “burned” portions of the plant looking reddish orange and very dry. 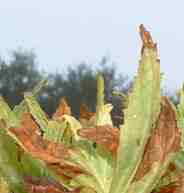 Frost burn does not necessarily mean the plant is doomed. If the burned part of the plant is cut from the plant, it has a chance to recover. In our case, however, the plants were very small and completely burned. Although we transplanted these plants after the USDA frost date, that date is a guideline and not iron clad in their certainty about climatic conditions year to year. For this reason it is good to check weather forecasts to assess frost risk and take steps to protect frost intolerant plants. A common tactic would be to cover the vulnerable plants with a sheet or tarp at night to trap the heat collected by the soil during the day. If the plants are in containers simply moving them inside before the frost hits should be fine. We are having drop in hours today from three to four this afternoon. We are going to install PVC piping underground that we are going to put the water barrel hose through so it can reach the garden while being out of the way of the U of M grounds lawn mowers. Also we are going to replace the lost plants by transplanting. I plan on making a dent on the garlic mustard patch that is on the grounds because it appears that the patch is sending seeds into the garden plots and the herb spiral. Garlic mustard is a very prolific invasive species that produces allelochemcials that harm mycorrhizal fungi which are vital for many plants to fix nitrogen into the soil thereby inhibiting other plants’ growth. 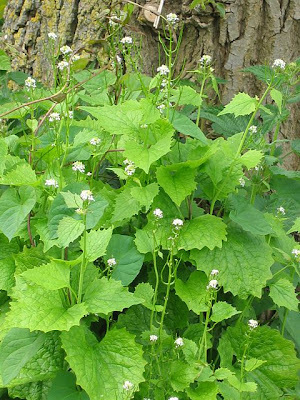 When weeding garlic mustard be sure to not place the plants in the compost because it is known to seed even if uprooted and also be sure to introduce a diverse mix of native species into the newly cleared area to fill the niche that was vacated. First post of summer 2009!